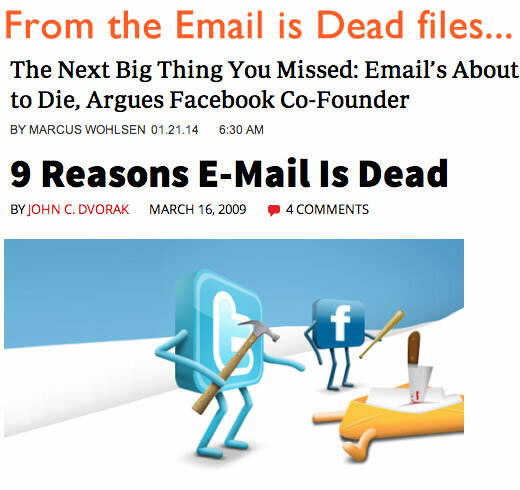 Maybe crap email is dead. The rest is doing fine. In the past week, three organizations I run into a lot online and through work posted writing jobs. More specifically, email writing jobs (a list of them is below). Writing in less than 140 character snippets, coming up with the pithiest text to put over a share image, and (at the other end of the spectrum) even longer form essays seem to be the skillsets du jour. Yet email remains a workhorse — building and connecting supporter networks more directly than social media. In combination with social media channels, video, websites, online ads and everything else, email can be more valuable. Email goes directly to the inbox, it can introduce a topic or remind the reader of something posted on Facebook or sent through postal mail. “But wait,” you might say, “I get way too much email” or, if you’re in the field, you’ll point out the single digit (and falling) open rates in most sectors of the email world. Both are valid points. There IS too much email and most of it is just plain BAD. But (see workhorse point above) email continues to reach people and help build relationships in informative and timely ways that other channels can’t do or at least don’t do well for many of our readers and supporters. That’s why these job postings and others like them are interesting. They reflect the value organizations place on well written email. There seem to be more of these openings lately. A great email message conveys a strong story and integrates tactical elements that move people to interact with the message — a strong subject line, action/donate links in the right places, appropriate imagery (or none at all), smart weaving together with print and social messaging, and informative testing of all the above. I’ve written a million advocacy and fundraising emails for NGOs/campaigns in the past 16 or so years. Okay, maybe a thousand. Who knows, really. Email strategy (and writing) is a core part of the work we do here. Great email bumps up open and click rates. It drives action, donations, sharing, and viewing. It builds relationships. A strong writer understands storytelling and contributes value to development of other content: video, web, social media and more. Email is a piece of the puzzle but don’t underestimate the value of doing it well. Here’s a list of the writing positions. They’re all great operations and at least two of them are open to remote work (though those are not full-time gigs). SumOfUs – Email writing consultant. Upwell, Tide Report contract writer. International Rescue Committee (IRC), Direct response digital writer. The IRC is also hiring an email and mobile engagement officer which is more of a strategic advocacy and campaign execution role in the same team.